As well as the individual sweaters below, I have lots of solid colored sweaters for mystery lots! I can try to honor color requests, but am limited to what I have on hand . I have the following mystery lots (10 sweater lots) available: 100% merino big mens argyle ($60), 100% wools (mostly merino) large mens patterned (darker/neutral colors, $60), all black 100% cashmere ($65), 100% cashmere short sleeved and sleeveless in a variety of colors ($50), 100% merino (wide variety of colors, $50), big mens 100% merino (mostly darker/neutral colors, but lots of material $50), lambswools ($55), 100% wool ($50), and soft blends of 70% wools or higher in a great variety of colors ($45). Some of the lots I have multiple quantities of, so just ask if you need more! pic. 5 - 2 100% wool blankets, approximately 60" x 76", black/light gray chevron pattern, $25 each [both sold], ..
pic. 6 - some solid colored cashmere, first 3 rows: $8 each, last row: $10 each (tan, pale aqua [sold], cream [sold], bright periwinkle [sold], black [sold], light lavender, light gray [sold], cabled bright green cardigan [sold], lightly felted cabled brown [sold], cabled peach [sold], cabled pink [sold], cabled red [sold], big blue, big green, big burgundy [sold],..
To view the sweaters for sale, simply scroll down to my Sweater Time posts, as well as my "sweaters still available post". To "call dibs" or ask any questions, please email me (resweatercontacts@gmail.com). If you call dibs, please understand that you are committing to purchase them. Asking questions does not obligate you to buy them, but does not hold the sweaters for you. Since I seem to get the same questions about Sweater Time, I will be posting this paragraph on the bottom of each Sweater Time post. Shipping pricing: I charge actual shipping, rounded up to the nearest dollar for orders that are under my shipping max. Those in Illinois, Wisconsin, Indiana, and Michigan pay a max of $8.00 for shipping per order of up to 20 sweaters, and all other continental states only pay $12.00 shipping for up to 20 sweaters. Orders with 21 sweaters or more, will add $8.00 for a max of $16.00 for unlimited sweaters to Illinois, Wisconsin, Indiana, and Michigan. For all other continental states, add $10.00 for over 21 sweaters for a total of $22.00 shipping for unlimited sweaters. The shipping max for non-continental states (Alaska and Hawaii) is $25.00 for up to 20 sweaters, and $40.00 for 21 sweaters or more. I have condensed, reorganized, and marked some of these down, so hopefully it will be a little easier to navigate than the last "sweaters still available" post. To purchase, or for any questions, just email me at resweatercontacts[at]gmail[dot]com. pic. 147 - Some soft striped blends, $8 each (purple/white 80% wool/20% nylon, maroon/peach/tan 85% merino/15% polyester, black/white 80% wool/20% nylon) [all sold],..
pic. 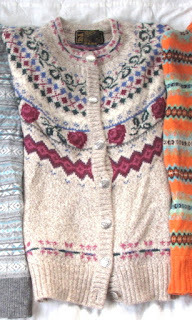 102 - Some alpaca cardigans (100% alpaca dark blue with people [spot on top is sunlight and not stain, $10], blue 100% alpaca [$10], brown/gray/red fair isle 85% wool/15% alpaca [$8] [sold])..